New BHIM App users will receive Rs 51 cashback on completing their first transaction. Bharat Interface for Money (BHIM) App has rolled out new cashback plans for its customers as well as merchants. The offer can be availed by both new and existing users. The customer cashback scheme gives users up to Rs 750 cashback every month, while merchants can get cashback up to Rs 1000 per month. “Great news for @NPCI_BHIM users!! @NPCI_NPCI announced alluring #BHIMCashback plans for new and existing users, for ‘customers’ & ‘merchants’ both,” Digital India said in a Tweet. New BHIM App users will receive Rs 51 cashback on completing their first transaction. The app needs to be downloaded from your registered mobile number. Users will habe to link their bank account and do the first transaction – send Re 1 or more – successfully to get the cashback amount. BHIM App will also give out Rs 25 cashback for every unique transaction done via VPA/UPI ID, account number or mobile number. The minimum transaction value should be Rs 100. Users can earn a maximum cashback of Rs 500 per month. 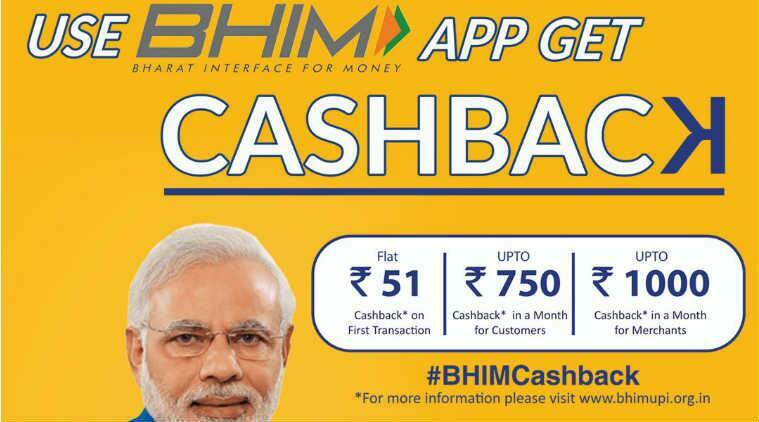 In case BHIM App users make 25 or more transactions, but less than 50 per month, they will get Rs 100 cashback. For transactions more than 50 and les than 100, Rs 200 will be provided as cashback. People who do more than 100 transactions monthly will get Rs 250 cashback. All of these transactions need to of Rs 10 or above. The merchants on the BHIM App will get cashback of 10 per cent of the transaction value – a maximum of Rs 50. Other bank merchants who receive UPI payments through BHIM App will get cashback of 10 per cent of transaction value, a maximum of Rs 50. The BHIM App, which was launched by Prime Minister Narendra Modi, is based on UPI (Universal Payments Interface) and thus linked directly to a bank account. Your friend, relative or even a merchant who you’re trying to pay doesn’t necessarily need to be on the BHIM app. All they need is a bank account to receive the payment. BHIM also has options to transfer via IFSC, MMID as well for non-UPI banks. It also means the government has decided to go with one app that will enable digital payments via UPI.